Waitangi Day: Day of rest? End-of-summer-holidays-day? Holy-day? Waitangi Day has perhaps many layers but it is also officially a national day commemorating the first signings of the Treaty of Waitangi – Te Tiriti o Waitangi, in 1840. When I was younger, back in the early 1970s I remember graffiti around Wellington saying, ‘The Treaty is a fraud’, scrawled by young activists reflecting disillusionment with what had happened to Māori since 1840. Recent Waitangi Tribunal reports on the history of different parts of Aotearoa New Zealand would back up that disappointment. By the same token, since the 1980s the Treaty has become recognised as the founding document of New Zealand’s constitutional history and central to our country’s governmental system even if that is still being worked out in practice and many debates continue. Part of the history of Te Tiriti o Waitangi is the spiritual or wairua dimension. There is the mana and tapu of the people who signed the treaty from both sides; their dignity as representatives of their people counts. And from the Christian point of view there is the involvement of representatives of the Christian Churches in espousing, translating and accompanying the Treaty. In the Colonial Office in England, Christians had advocated for better treatment of native peoples. At Waitangi, the Treaty was translated from English into Māori in preparation by Anglican missionaries in the Bay of Islands. Bishop Pompallier was present at the signing and made a significant intervention about religious freedom in New Zealand. Missionaries from the Anglican and Wesley traditions accompanied the Treaty at various other signing points around the country. So there is a sense in which the treaty is a covenant, an agreement with a religious/spiritual dimension – similar to God’s covenants with the human family. 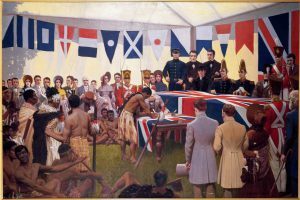 The treaty has a legal dimension with its wording of rangatiratanga, sovereignty, rights and privileges of British citizens. It has a political dimension in terms of the colonial context and competition between British and French empires. But for all its strengths and limitations it also signifies something of the human search to live together in harmony. And because of the Christian involvement in its signing and the Church’s mission to bring about a better world we can mark Waitangi as a significant spiritual event and a time to pray for the land and its peoples. We can give thanks for the gift of being here, ask forgiveness for the wrongs of our history from which some have benefitted and some have lost, and re-commit ourselves to work for a more just society. The annual Mass for Waitangi Day hosted by St Mary of the Angels in conjunction with Te Ngākau Tapu and with song in Latin, te reo and English and prayers in various other languages will be held at St Mary of the Angels at 9am on Waitangi Day, 6 February, at which Cardinal John Dew will preside. It is a rare and special opportunity. Masses for Waitangi Day will be celebrated at the Cathedral of the Holy Spirit, Palmerston North, at 9am Wednesday 6 February and at 9.30am Sunday 10 February, at which Monsignor Brian Walsh will preside. Come and pray for our bicultural and multi-ethnic land. Nau mai, haere mai! 2019 begins and there are two days we are able to sleep in and rest. One being the celebration of the 179th Wellington Anniversary Day commemorating the arrival of settlers on 22 January into Wellington and then the 178th commemoration of Waitangi Day where on 6 February, the Tiriti o Waitangi was signed. As Catholics our call is to look through a lens informed by Catholic social teachings based in the Gospels. It is for this reason that we recognise the past and current hurt, injustices suffered by our first nation tribes, subtribes and families at the hands of settler colonisers. The Gospels challenge us all to strive to build a country that is free from racism, inequality and injustice. We the Church should constantly ask what is it to be a bicultural society couched in a multicultural reality? As Christians what is our response to our Tiriti partner, to Tangata Whenua? What is our response to our children and grandchildren? We are a people of hope. As we gather to commemorate this Waitangi Day, let us encourage each other to talk, to our neighbours, to our friends, children and grandchildren. Ka tīmata te tau 2019 me ngā rā whakanui e rua nā ka taea e tāua te moeroa me te whakangā. 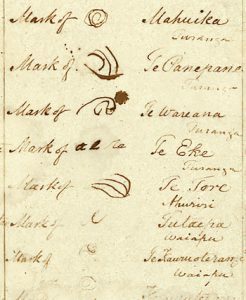 Ko te huritau 179 o te Whanganui-a-Tara tētehi, arā te 22 o ngā rā o Hānuere e whakanui nei i te taenga mai a tauiwi ki te Ūpoko o te Ika, ā ko te Rā o Waitangi tētehi, te 6 o Pepuere e whakanui nei i te hainatanga o te Tiriti o Waitangi. Kua karangahia tāua te hunga Katorika ki te āta tatari i ngā tūāhuatanga katoa mā te karu Ākoranga Katorika i whānau mai i ngā Rongo Pai. Mā tēnā, ka taea e tātou te rongo atu i ngā mamae, ngā pēhitanga e ngaukino nei i te tangata whenua, arā ngā iwi, ngā hapū me ngā whānau nā te ringakaha o tauiwi. Ka werohia tāua e ngā Rongo Pai ki te whakairo i tētehi ao e noho kore aukati iwi ana, e noho kore taihara ana. E te hāhi, i ngā wā katoa me pātai te pātai he aha tēnei me te tikangarua i tēnei ao tikanga maha? He aha tō tāua mōhiotanga, māramatanga? E te hunga Karaitiana, he aha tō tātou whakautu ki te hunga Tangata Tiriti, ki te hunga Tangata Whenua? Me pēhea rā te whakautu ki ā tātou tamariki mokopuna? He hunga tūmanako tātou. I a tātou e hui ana ki te whakanui i te Rā o Waitangi, kia kaha tātou ki te akiaki tētehi ki tētehi, ō tāua hoa noho piritata, ō tāua hoa, ō tātou tamariki mokopuna. 9am, The Cathedral of the Holy Spirit, 197 Broadway Avenue, Palmerston North. The Mass will incorporate prayers, readings, homily, and hymns appropriate to the celebration. 9am, St Mary’s Church, 69 Ruahine St, Palmerston North. 10am, Our Lady of Lourdes Church, 96 Shamrock St, Palmerston North. At the 9.30am Mass at the Cathedral of the Holy Spirit, on Sunday 10 February, a special focus will be on Waitangi Day, enabling the Sunday Mass attenders to participate in this important commemoration. Monsignor Brian Walsh will preside at the Cathedral Masses. The annual Mass for Waitangi Day hosted by St Mary of the Angel, in conjunction with Te Ngākau Tapu and with song in Latin, te reo and English and prayers in various other languages, will be held at St Mary of the Angels Church, Boulcott St, Wellington, at 9am on Waitangi Day. Cardinal John Dew will preside at this rare and special opportunity.